I love where I live. It’s extremely green and not uncommon to have incredibly beautiful yards and gardens. In the time I have lived in Oregon I have invested a lot of time, money and energy into my yard and flower gardens. My yard hasn’t always been filled with flowers. When we moved here there was nothing more than a plant or two sporadically placed that were very misplaced. In the last six years we’ve had lots of work done to both the property and our home. Everything from fencing five acres of land, adding hundreds of plants and flowers around our property, building horse stalls, having two bathrooms remodeled and other such improvements. Our current big project is the installation of a new sprinkler system. I’m so excited at the thought of not having the manually move the hose around the yard. That’s quite a chore in and of itself. I know the lawn will be greener than ever, I won’t have to think about watering and the flowers will grow like never before. But this won’t be without a period of inconvenience. 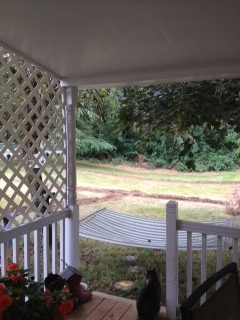 As the pipes are being installed our yard is in disarray. The lawn is turning brown due to us not watering while the job is being completed.